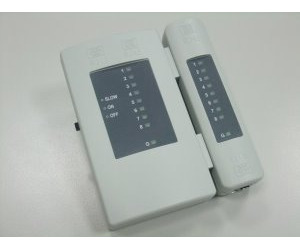 The handheld Lan cable tester is an intelligent tester to scanning cables continuously like Lan cable, phone cable and coaxial cable. Easy to diagnose RJ45 Lan cable, phone cable, BNC cable with present wiring schemes. Easy to read the statue of each wire with LED display. Easy to diagnose the situation of open, short, miss wiring, cross over and groud. The three-step switch for slow, on and off.